Suites are grouped in small numbers in individual rooms. Deluxe Suites are 30 square feet ($40 per night for the first dog and $30 per night for the second dog sharing the suite). Superior Suites are 50 square feet and have a window ($55 per night for the first dog and $45 per night for the second dog sharing the suite). All the suites have porcelain tile, dog beds, and full length glass doors. There is room in the center of the suites for socialization. When your pets stays in one of our suites, it will also get play time and socialization with a pet nanny and other dogs in our indoor play room. In addition, your dog will be walked at least three times daily in our secure, fenced outdoor play area. We offer a variety of accommodations for our guests to fit various budgets. In addition to the suites, you may also choose to have your pet stay in a traditional cage. Your dog would stay in one of four different sizes of cages ($20, $22, $25 or $28) based on its size. Your pet will be taken outside for walks at least three times daily. We do not charge extra if your pet needs to go outside more often. If you would like to add play time/socialization, this can be done daily or the days you specify at a rate of $10 per day. Daily rate $20,savings package available. and outdoor fenced area throughout the day. 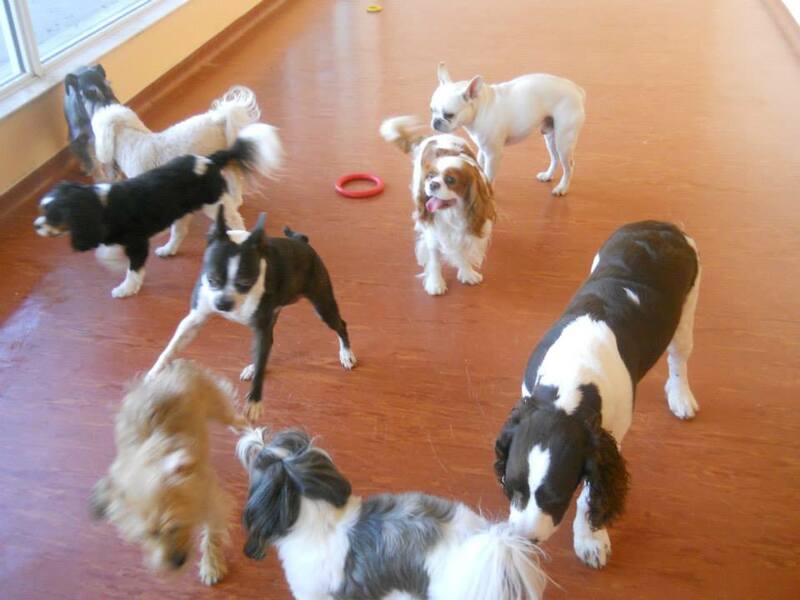 Pet nannies are always with the dogs during play time and exercise. Each dog is placed in a suite for nap times and snacks/meals. If your dog can't play with other dogs then it will get individual play time with one of our pet nannies. Cats are housed in a separate room. Our feline guests stay in multilevel kitty condos ($19 per night for a single condo and $35 per night for a double condo) that have clear back panels so they can see the underwater mural with fish, coral and dolphins. The front doors have a glass panel and the condos face windows with a view of the garden. We have passion vines planted along the fence that are already producing butterflies. Each condo is connected to the ones next to it with a port hole which can be opened if you would like to reserve additional space for your cat. If you have multiple cats staying with us, we can connect the condos so the cats can move back and forth between condos. We do not house sick pets in any of the boarding areas. We have an isolation room and ICU ward for sick pets so they never have any contact with the healthy pets. You can drop off and pick up your pet any time during regular business hours. We charge by the night. We do NOT charge you extra if you pick up in the afternoon. We do not have any age or breed restrictions. We do not have a minimum stay requirement. We offer professional grooming but we do NOT require your pet to have a bath. All pets must be free of fleas and ticks at drop off. If necessary, they will be treated for parasites at the owner's expense. Please confirm your reservation at least 24 hours in advance. If your pet is staying with us during a holiday, we will need a credit card to hold the reservation, and a confirmation seven days in advance. Cancellations during the seven day period will incur a fee equivalent to one nights stay per pet. We provide all the dishes, food, beds or blankets. If your pet is on a special diet, medications or if you would like your pet to have its favorite toys, then please bring those items for their stay. All pets must have proof of vaccination or receive their vaccinations at drop off. As of October 18, 2018 Influenza vaccine will be required for all dogs using our daycare or boarding services.